TLCU Financial came to PLAY Creative looking for ways to engage and grow its membership on the cusp of the 65th anniversary of opening their doors. This Indiana Credit Union has plenty of history and many interesting member stories to tell, but needed our help to communicate those stories to their community in a creative way. After some brainstorming, the PLAY team focused on 1953—the credit union’s founding year—thanks to the wealth of historical and cultural happenings from that same year. To create a campaign though, our creative challenge was aligning those historical events with TLCU. It’s one thing to say that a business is 65 years old, but it’s another to truly make members and prospective members aware of just how long 65 years in business truly is. To give proper good context for how long TLCU has been serving its community, shared a few other significant things that happened in 1953. Paints a pretty good picture of how long ago 1953 was, doesn’t it? With a theme for the campaign, we got to work choosing cost-effective media to use to promote TLCU’s 65th anniversary and how to use it to promote the anniversary specials they offered when the campaign officially launched. To create real-life examples of how TLCU is a community partner, we crafted a message that the CEO could personally send to members asking about positive experiences they had with the credit union, and the responses didn’t disappoint. We then showcased the best success stories on the TLCU Financial website. We had no idea what kind of responses we’d receive, but were pleased to hear about members whose lives were truly bettered by working with TLCU. 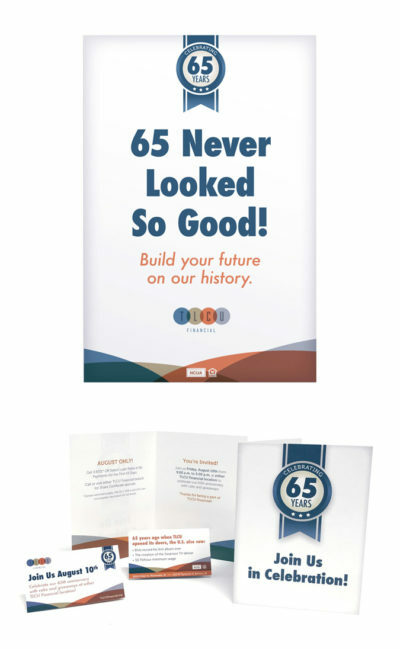 Lastly, we created promotional materials to promote 65th anniversary open house TLCU would host, including greeting card invitations, handouts for tellers to give to members, an on-hold phone message for the credit union.